Frank Sinatra became a huge star in the 1940s, attracting hordes of female fans (known as bobbysoxers). During the 1950s he became the King of Las Vegas, performing and hanging out in the casinos of the Strip, even as he made some of his most famous albums. He was joined there by his friends, who were known as the Rat Pack. Dean Martin, Sammy Davis, Jr., Peter Lawford and Joey Bishop constituted the pack, but there was never any doubt that Sinatra was the linchpin of it all, and the biggest star. Curiously though, although there’s been a lot of peripheral Sinatra and Rat Pack memorabilia, the market has never been flooded with more desirable material. That’s not to say you won’t find items on the market, by any means. There’s everything from cars to autographs available, and the prices are still relatively reasonable, but you have to hunt for it. Most sellers, be they merchants or those selling by auction, are in America, which is no big surprise, given that Sinatra spent his life there, recording there and mostly performing there. Everything has its price, and Sinatra memorabilia, with or without the Rat Pack, isn’t as costly as you might think. 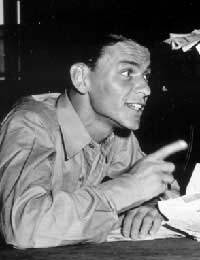 A car that reputedly belonged to him, a 1985 Chrysler LeBaron, was offered for auction with a starting price of £20,000, whilst a contract for Sinatra’s role in the film Anchors Aweigh was offered on eBay for a starting price of £1,600. An autograph sold for a very low £150, but a shadow box with pictures of the Rat Pack and autographs was being offered by a merchant for £2,500 – a significant jump in price, and a framed Sinatra autograph from the early 1950s was on sale with another dealer for £500, with a collection of three Rat Pack autographs going for £650. Gold records do crop up from time to time – one sold in 2006 was for the single My Way – but they’re relatively rare. Far more common are posters for movies such as Ocean’s 11, the Rat Pack movie of 1960, although you need to be certain you’re getting an original, not a reprint (even the Italian ones have been reprinted and are offered for sale). Sinatra is the most collectable of the crew, but he’s just one of the pack. If you’re interested in collecting Rat Pack memorabilia, you might do best to start with some of the other names. You can buy a Sammy Davis autograph for £30-40 (an autographed LP was offered for £350, framed), or pay a similar price for a Dean Martin autograph. Vintage photographs are a cheap way to begin, since they’re readily available, and for a small investment, you can acquire a good collection. However, whether they’re worth much as an investment is debatable. Movie posters can also be found relatively cheaply, with prices going up to around £50-75 – Sinatra had a very credible movie career, and Dean Martin made many films, including those with Jerry Lewis. Again, you need to be sure they’re originals. Records aren’t a good investment. Even older LPs were sold in such large quantities that they have no real rarity value. There are a few public Sinatra and Rat Pack collections, although none of them is especially large. It’s unlikely there’ll ever be a flood of memorabilia released, so prices will likely continue to increase. But, although Sinatra is one of the most revered singers of the 20th century, he’s yet to achieve the collectability of rock figures.